This excellent recipe is courtesy of Food 52. Rub or brush a little bit of olive oil on both sides of the bread slices, then broil or grill the bread until crisp and toasted. When the toasts are cool enough to handle, rub one of the the garlic cloves on one side of each toast and set the toasts aside. Trim any tough stems and woody bits from the rabe and wash it well, leaving a small amount of water clinging to it. Roughly chop the rabe into about 1 to 2-inch lengths. Thinly slice the remaining garlic cloves, warm another tablespoon or so of the olive oil in a pan over medium heat, then add the sliced garlic, a pinch or two of chile flakes, and the broccoli rabe. Add a pinch of salt and toss the rabe until it is coated with oil, then cover the pan and cook over medium-low heat, stirring occasionally. When the rabe is soft and tender, turn off the heat, add the lemon juice and zest, and gently toss. 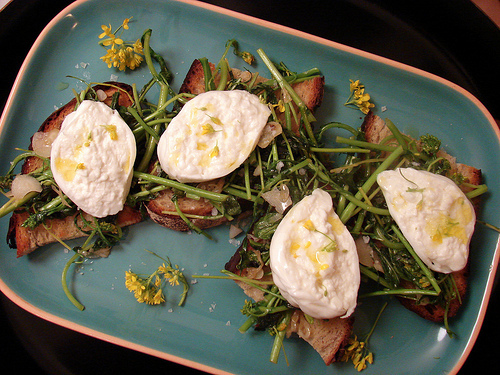 Place the toasts on a serving platter or individual plates and spoon the broccoli rabe over them. Cut the burrata into four equal pieces, being careful not to lose the milky liquid inside, then place the a piece on top of each toast, cut side up. Sprinkle a little flaky salt over the top and drizzle with your very best extra virgin olive oil.